Vasculitis is inflammation of the vessel walls leading to an alteration of the vascular wall. They are still called vasculitis or angiitis. The cause of Horton’s disease is poorly known, reaching exclusively people over 60 years including the external carotid artery: it is responsible for many ischemic phenomena in the face, including an anomaly of the temporal arteries, mandibular claudication, necrosis of the face (tongue and lips) or scalp, headache, pain, and hypersensitivity of the scalp. Ophthalmological signs can be serious (visual acuity, oculomotor palsy, ptosis, pupillary abnormality) and lead to blindness by generally irreversible ischemic optic neuritis. The preceding signs may be missing or be associated with an alteration of the general state, fever, vascular abnormalities (limb claudication, inflammatory arterial aneurysms, especially aortic, even certain forms of stroke, myocardial ischemia or digestive, Raynaud’s syndrome), rheumatologic (pseudo-rhizomelic arthritis) or respiratory (unexplained dry cough). The clinical signs are often not very evocative; the attention is generally attracted by a very important inflammatory syndrome (sedimentation rate higher than 80 mm at the 1st hour) and disruption of the proteins of the inflammation in the blood. Examination of the temporal arteries by arterial color-Doppler ultrasound shows arterial flow anomalies associated with a peri-arterial inflammatory halo. The diagnosis is confirmed by histopathological examination under the microscope of an arterial fragment, most often the superficial temporal artery with a size of at least 3 cm. Oral corticosteroid therapy is the standard treatment for Horton’s disease. Takayasu’s disease or “disease of women without a pulse” is of unknown origin, affecting the aorta, its branches (coronary arteries, carotid, subclavian, vertebral, renal, and iliac) as well as pulmonary arteries. Where his name “aortic arch syndrome”. This rare disease especially affects the young woman between 20 and 35 years. It is found more frequently in Asia. We distinguish the acute period, called pre-occlusive period and the occlusive period. The pre-occlusive period is characterized by the appearance of general unspecific signs (fever, joint pain, deterioration of the general state, slimming …). Then there is neck pain along the course of the carotid artery (carotinodynia) more suggestive of the disease, pain of the upper limbs, weakness or a more pronounced fatigability from one side to the other. At the occlusive period, the arteries become narrowed (stenoses) or occluded. It can be noticed incidentally when taking the different blood pressure between the 2 arms or absence of a pulse in places. Arterial Doppler ultrasound-color, angio-scan, or angio-MRI, PET-CT (Positron Emission Tomography) and arteriography show stenosis in “candle flame” or “tail” radish “, arterial occlusions or aneurysms, inflammations of the wall of the aorta (aortitis). The treatment is based on steroids for one to two years, sometimes combined with immunosuppressive therapy (methotrexate, azathioprine, mycophenolate mofetil). Periarteritis nodosa (PAN) is a very rare necrotizing vasculitis that can affect many organs, whose cause is poorly known (some forms are linked to the hepatitis B virus). Joint pain predominates in large peripheral joints: knees, ankles, elbows, and wrists. Nerve damage is often called multineuron, affecting several nerves such as sciatica, external or internal popliteal, radial, ulnar or medial nerve, and is often associated with distal segmental edema. Untreated neuritis eventually causes atrophy of the muscles innervated by the nerve concerned. Vasculitis can also affect the brain more rarely, which can lead to epilepsy, hemiplegia, stroke, ischemia or hemorrhage. The evocative sign on the cutaneous plane is the purpura (purplish spots which do not fade when pressed on), curved and infiltrated, especially in the lower limbs or livedo, forming sorts of meshes (livedo reticularis) or mottles (livedo racemosa) purplish on the legs. We can also see a Raynaud phenomenon (some fingers whiten cold), even gangrenes of finger or toe. Orchitis (inflammation of a testicle) is one of the most typical manifestations of PAN, due to a vasculitis of the testicular artery that can lead to testicular necrosis. A biological inflammatory syndrome is present in the majority of patients with PAN (increased sedimentation rate to more than 60 mm in the first hour, C-reactive Protein …), a major eosinophilia (increased white blood cells) eosinophilic polynuclear cells). Angiography reveals microaneurysms and stenosis (reduced size or tapered appearance) of medium-sized vessels. Biotherapies take place in the management of PAN, including rituximab (anti-CD20). Buerger’s disease or thromboangiitis obliterans is a vasculitis involving segments of small and medium-sized arteries and veins of the lower and upper limbs, causing thrombosis and recanalization of affected vessels. This disease is more common in Asia and among Ashkenazi Jews. Arteriography reveals the involvement of distal arteries. Treatment involves the total cessation of smoking which is a triggering an aggravating factor of the disease. It is possible to have to resort to revascularization surgery. Kawasaki disease or “adenocutaneous-mucous membrane syndrome” is a vasculitis affecting the territory of the coronary arteries, responsible in particular for coronary aneurysms which can be a source of mortality, especially in children between 6 months and 5 years old with a peak frequency at the age of 18 months. Convalescent-phase, in principle without symptoms, but during which sudden cardiac complications may occur due to the formation of coronary aneurysms in the previous phase. Significant inflammation is observed in the blood with a sedimentation rate greater than 100 mm in the first hour and a very high C-reactive protein, a clear increase of polynuclear leukocytes greater than 20 000 elements / mm3, and an increase in platelets. The treatment is based on immunoglobulins injected intravenously (Ig IV) as soon as possible to limit the risk of a coronary aneurysm. In the absence of IVIG efficacy, doctors use intravenous cortisone or aspirin. It is a large group of vasculitis of the arterioles, venules or capillaries whose prognosis is very variable depending on whether it is pure or systemic cutaneous vasculitis. 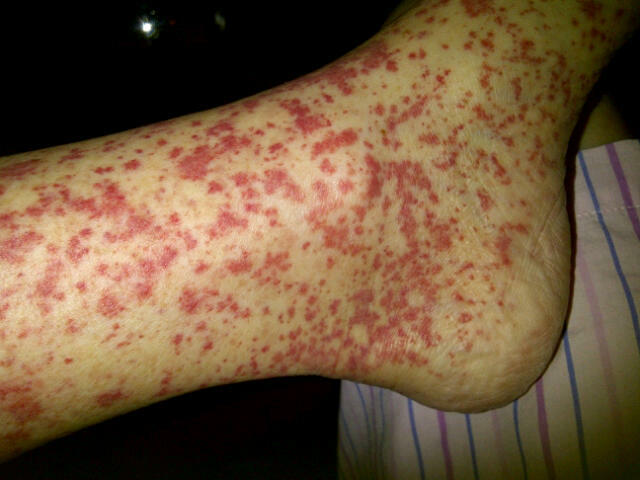 The most common clinical aspect is purpura (purplish spots that do not fade when pressed), bulging and infiltrated, especially in the lower limbs, aggravated by the standing position, which can take many forms (petechial and ecchymotic, necrotic , pustular …) or livedo, forming sort of mesh (livedo reticularis) or mottled (livedo racemosa) purplish on the legs. We can also see a phenomenon Raynaud (a few fingers whiten cold). Purpura and livedo may be associated with other lesions on the skin (papules, nodules, necrotic lesions, hemorrhagic bubbles), fixed urticaria that does not itch. The doctor prescribes examinations which aim to search for a cause and signs of gravity: blood test with counting of the blood cells, search of inflammation, liver and renal evaluation …, search of blood in the saddles and X-rays in function of the points of call (radio of lungs in case of breathing difficulties …). Micropolyangéite (MPA) is a systemic necrotizing vasculitis whose clinical signs are very close to those of PAN. MPA is associated with ANMA anti-myeloperoxidase (anti-MPO) and classically gives a rapidly progressive glomerulonephritis and pulmonary involvement that is absent in PAN. Conventionally, diffuse ENT (destructive pansinusitis), pulmonary (parenchymal nodules), and renal (nucroactive gluculonephritis pauci-immune to crescents) affect the classic triad of Wegener granulomatosis. Mucocutaneous involvement affects about 50% of patients: purpura (purplish spots that do not fade when pressed), bulging and infiltrated, papules, subcutaneous nodules, skin ulcers, pustules, vesicles, hyperplastic gingivitis. ..
ANCA is a diagnostic and scalability test for Wegener’s granulomatosis, with diffuse cytoplasmic fluorescence (c-ANCA), finely granular with perinuclear enhancement and/or purely perinuclear fluorescence (p-ANCA). The management of Wegener’s granulomatosis, which can sometimes be considered a medical emergency, should be carried out in a specialized hospital setting, by a combination of cortisone and oral cyclophosphamide. Asthma is a major and early criterion of this vasculitis, which proceeds on average 8 years before the first signs of vasculitis (neuropathy, sinus disorders …) and persists afterward.